I’ve been wanting to write this guide of restaurants everyone should try in Chapel Hill for a while now. Ever since several people told me nonchalantly that “there’s nothing in Chapel Hill” when discussing the food scene of the Triangle. While the smallest of the three points of the Research Triangle, Chapel Hill is still mighty! So here’s my list of nineteen restaurants everyone should visit in Chapel Hill. 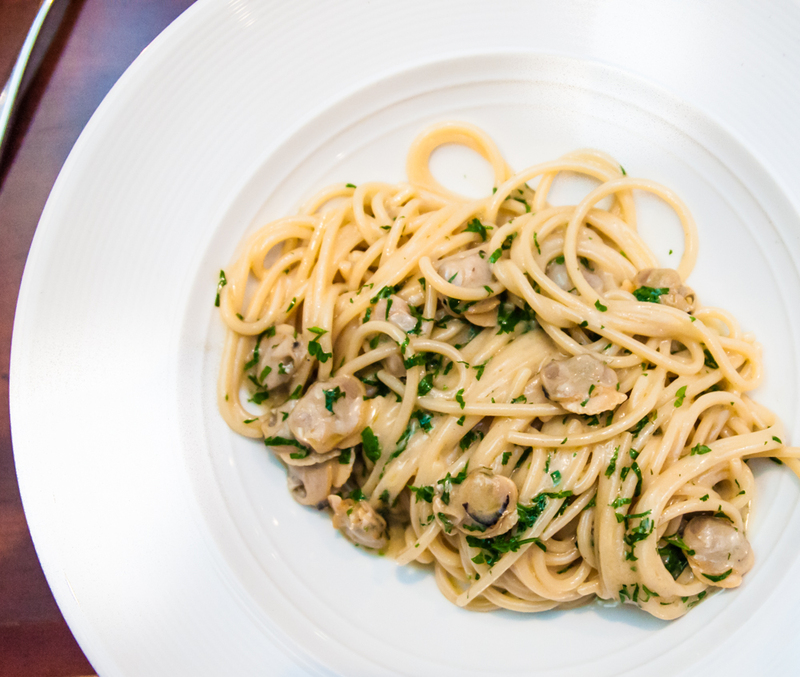 I’ve heard passionate Italian people call Il Palio the best Italian restaurant in the Triangle. It’s certainly my favorite Italian restaurant thus far. The service is always impeccable and the food is exceptional. I’ve not had one thing that didn’t impress me. I love their pappardelle bolognese, the gnocchi, linguine and clams, even their charred broccoli! I mean it when I say everything. The focaccia bread is the best focaccia bread I’ve ever had. Finally, don’t forget to save room for dessert. I come to Al’s Burger Shack specifically for the Mookie Burger and I moan and grunt the whole time I’m eating it. It has bacon-onion jam, roasted garlic aioli, blue marble cheese smothered over a juicy patty. 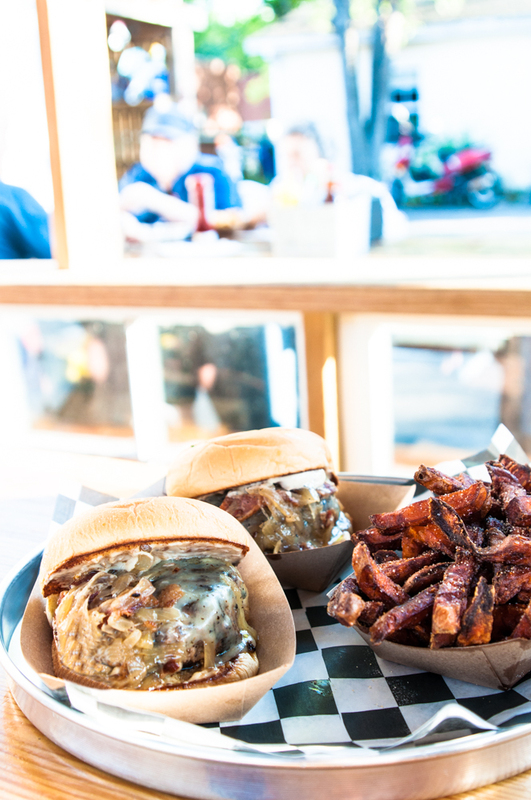 TripAdvisor recently named their chili burger as the best burger in the U.S. I can’t seem to stray from the Mookie, so you’ll have to try both and let me know! I’d describe the food at Elaine’s to be upscale Southern. The ambiance is intimate and nice, and not at all stuffy. I love being seated at the hightop near the window nook so I can watch the foot traffic on Franklin St. People watching on Franklin is always rewarding. Across the street from Elaine’s is Lantern. Chef-Owner Andrea Reusing won the 2011 winner of the James Beard award for Best Chef: Southeast. 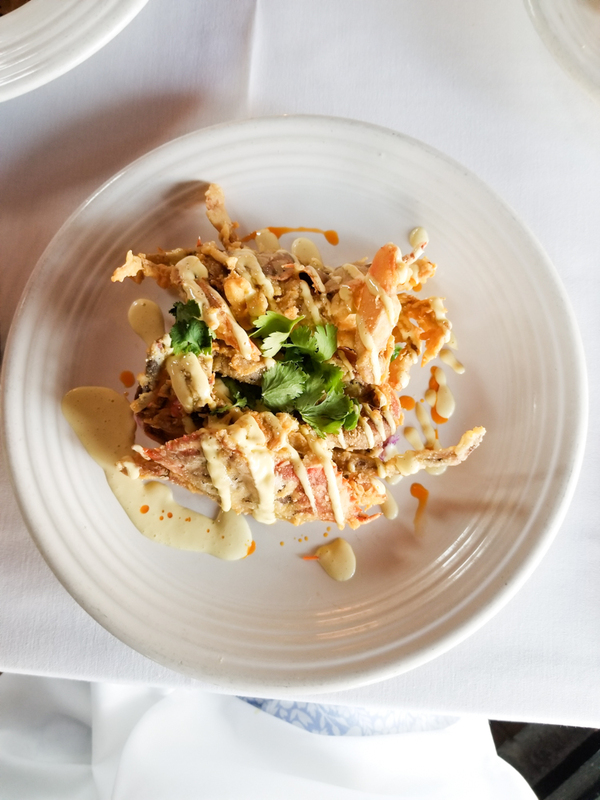 Lantern’s menu is inspired by Asian cuisine and made with ingredients produced in North Carolina. Their new patio just opened and I can’t wait to give it a sit! Sugarface and I come here at least monthly and feel so lucky to have a Bonchon in our backyard! 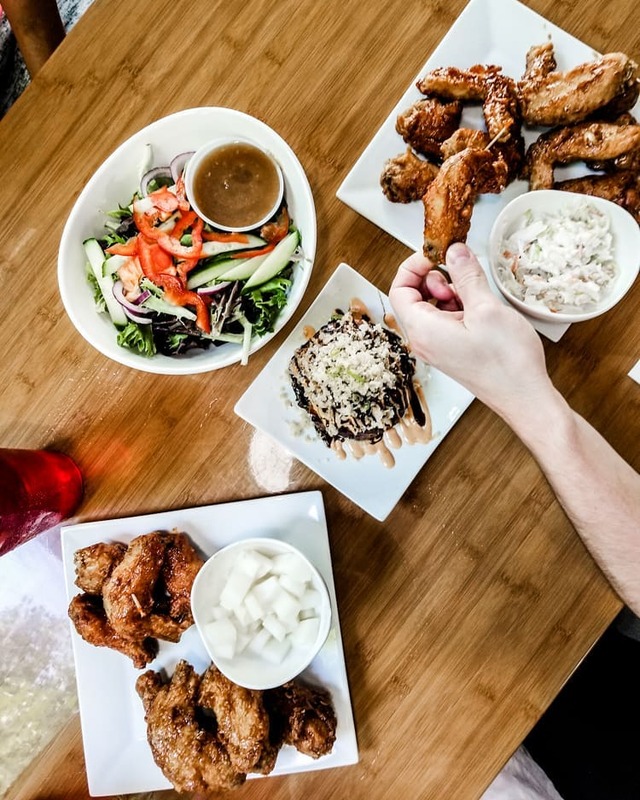 Bonchon is an international chain specializing in Korean Fried Chicken, and you do know I wouldn’t recommend a chain if I didn’t love it to pieces right? I’m so happy to have an awesome Malaysian restaurant in Chapel Hill. I noticed a general lack of Malaysian food in the area, so what a lucky gem for people who live in Chapel Hill! If you haven’t had Roti Canai with Curry Ayam, definitely give it a try! It’s a popular Malaysian dish comprised of buttery layered canai to dip in a potato and chicken curry. 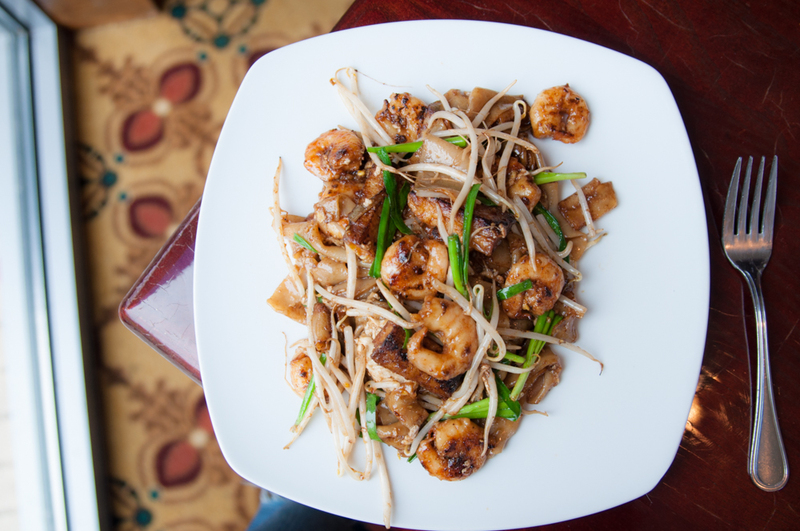 My favorite thing from Rasa Malaysia is the Penang Char Kay Teow (pictured above). The noodles have an amazing texture and smoky flavor. Another recommended dish is their mango salad; it’s served with Chinese Yu Tiao (fried bread, similar to a savory churro) stuffed with shrimp. I love Crook’s Corner for brunch! 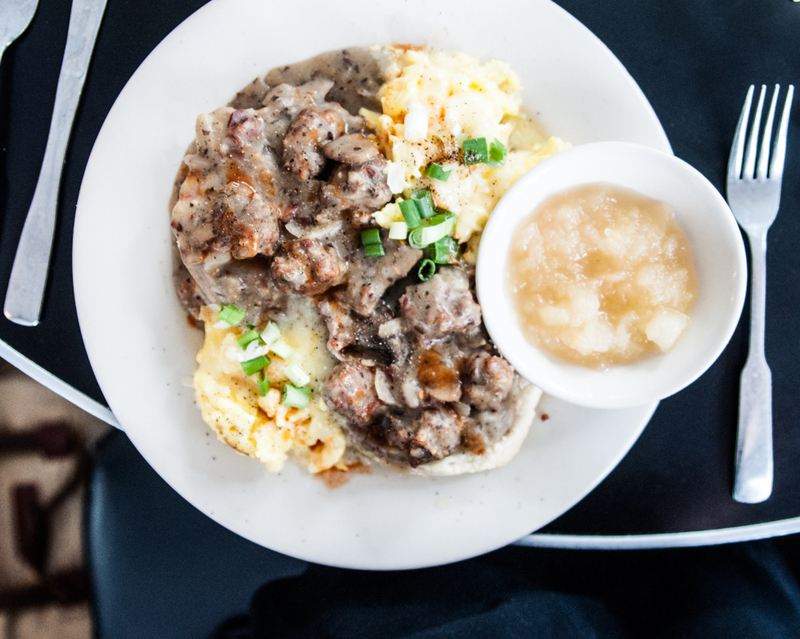 I’ve enjoyed Estelle’s Big Biscuit Breakfast (biscuit smothered in sausage gravy, bacon, mushroom gravy), and I am in love with their Shrimp and Grits! Reading up on James Beard nominated Chef Bill Smith and his advocacy for immigration rights made me a forever fan. I love little restaurants with big hearts. Make your brunch a boozy one and order their Frozen Mint Juleps! 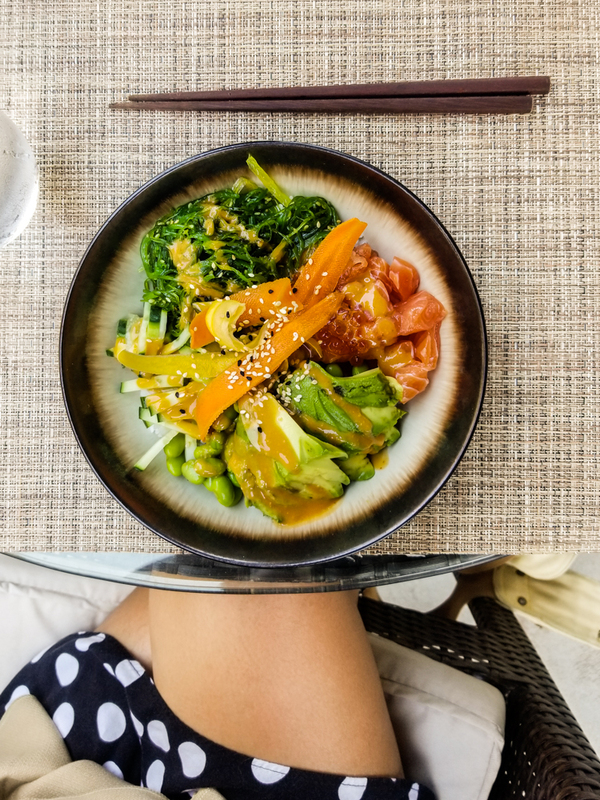 I’ve driven by City Kitchen’s unassuming location so often, and when I finally made time to schedule a lunch date there, I was so surprised by the beautiful atmosphere! Both their covered patio area which is lush with plants and the sleek interior feel like hidden gems. I found City Kitchen’s service so warm and inviting and the seafood entrees I tried were so good. They so kindly gave us more rustic bread to sop up the tomato seafood broth that came with my seafood stew. 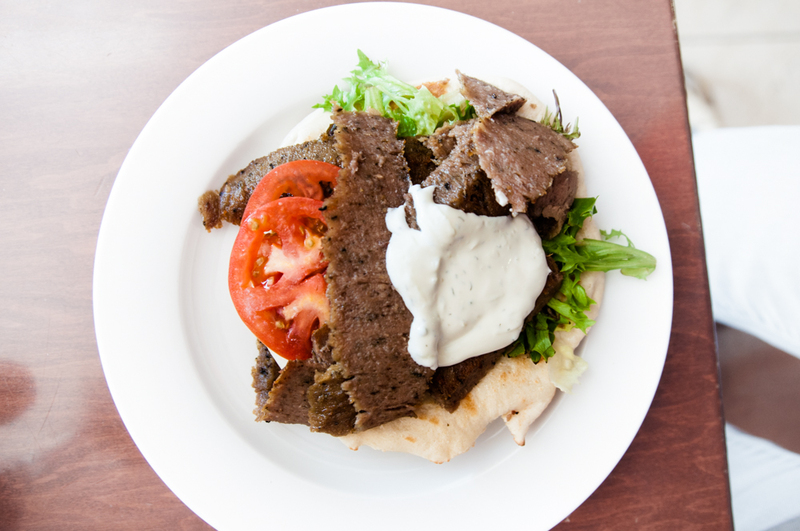 Kipos offers up Greek fare in a gorgeous space. 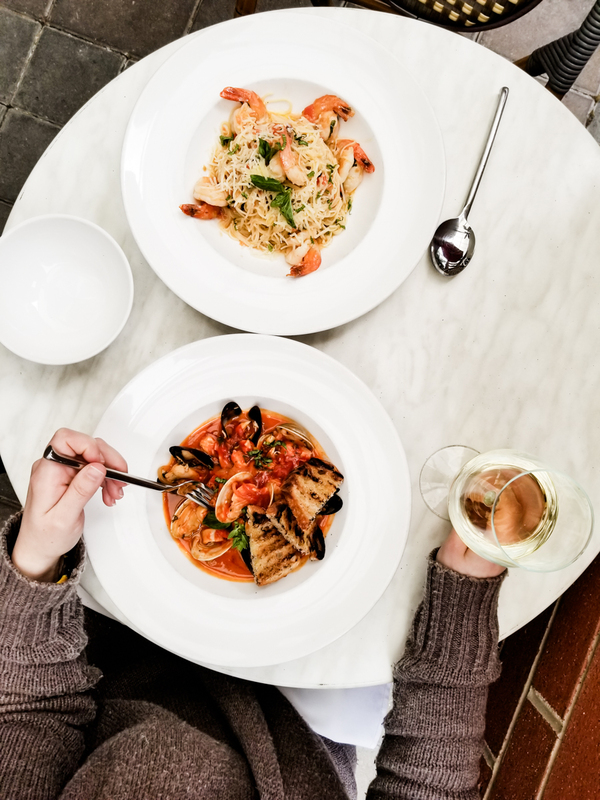 If you’ve been to any of the Greek islands, Kipos will make you wistful for your time there but then comfort you with their well-executed entrees. Do try their lemon ricotta pancakes for brunch! Oh, and their fries. 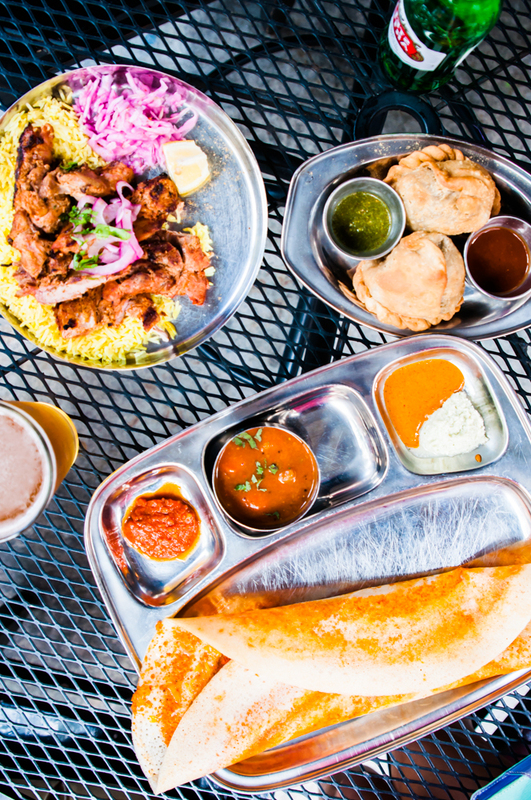 Not too far from Kipos is the beloved and tucked away Vimala’s Curryblossom Cafe, a happy spot for farm-sourced Indian fare and a late-night bar menu. Chef Vimala, like Chef Bill Smith from Crook’s Corner, is a humanitarian. She’s an outspoken activist for causes like international peace and stopping domestic violence. She also honors a living wage commitment to her staff. My favorite thing to order is her cheese dosa but I haven’t had a bad dish yet! 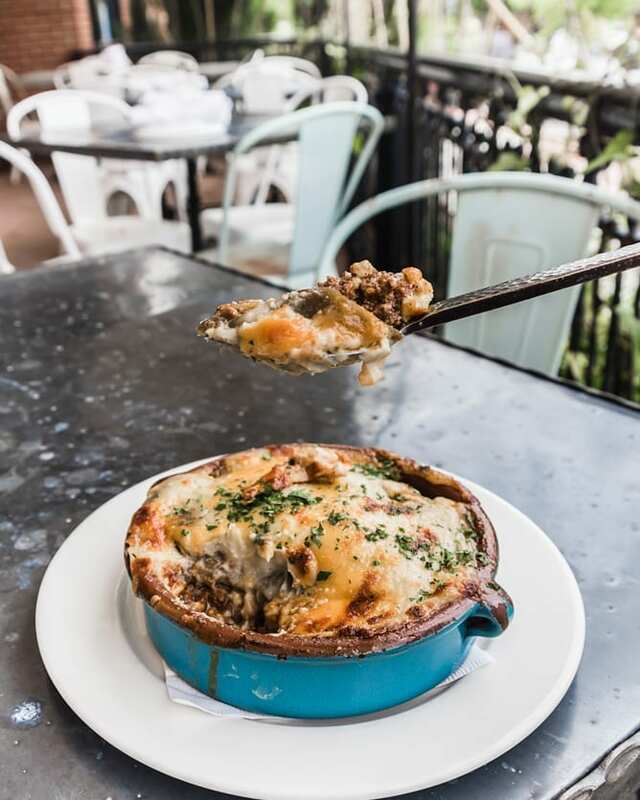 Kitchen is an intimate bistro serving up French fare and wine. Order their mussels! There is an adorable independent bookstore next door for you to peruse with your date before or after your dinner. Swasadee is one of my weekday lunch date spots I have with Sugarface. 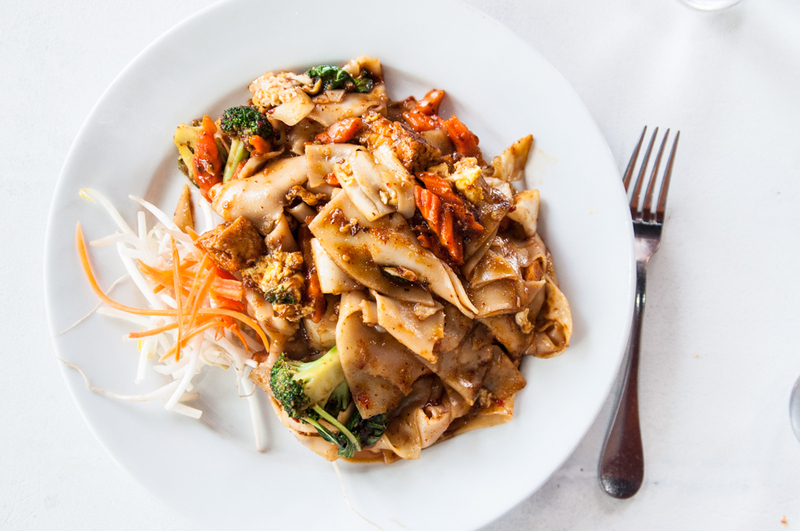 I am obsessed with the Drunken Noodles here. I’m such a sucker for wide noodles and not a lot of places have Drunken Noodles made with the wider rice noodles. 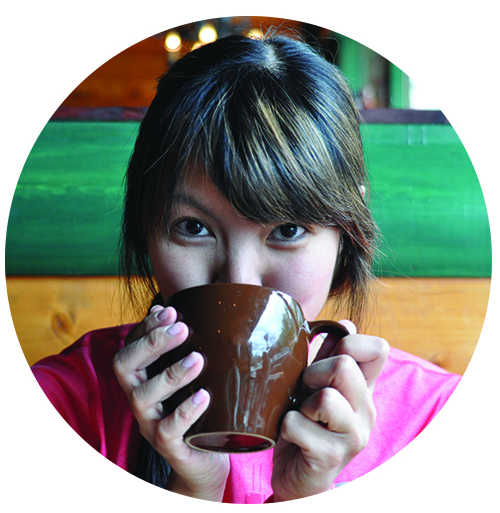 Jujube is a cozy little Asian inspired restaurant. 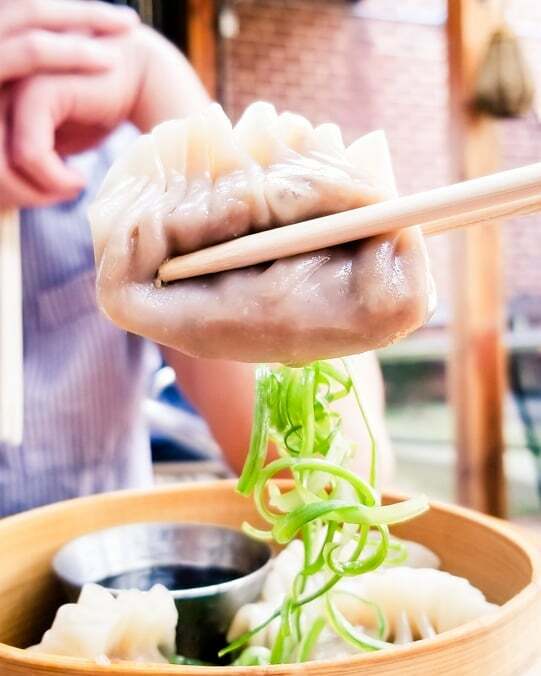 Pictured above is their barbecue pork belly dumpling. I’ve never had a dumpling like it! Another popular dinner dish is their version of a “Bolognese” which is hoisin braised shredded pork, scallions, and wide rice noodles. The flavors were very rich and they may ask if you’d like some rice to go with your noodles. I declined, but I think you should go for it! On point flavors but a tad salty. Mixing in some of the rice would have made it just right. Try their duck eggrolls! Similar to Jujube, Elements is also an upscale Asian-inspired restaurant. Unlike Jujube, the interior is larger and more modern. I want to try more of their menu but loved sitting outside with my bowl of poke the first time I went! 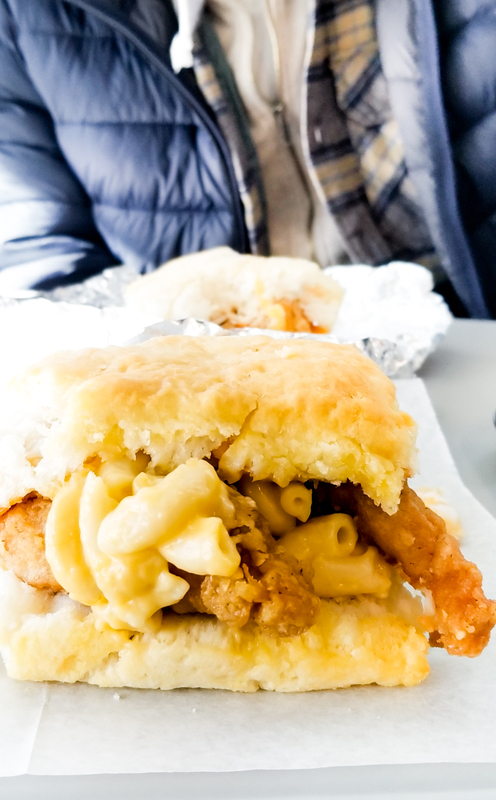 When in the South, you must partake in the chicken biscuit sandwich. 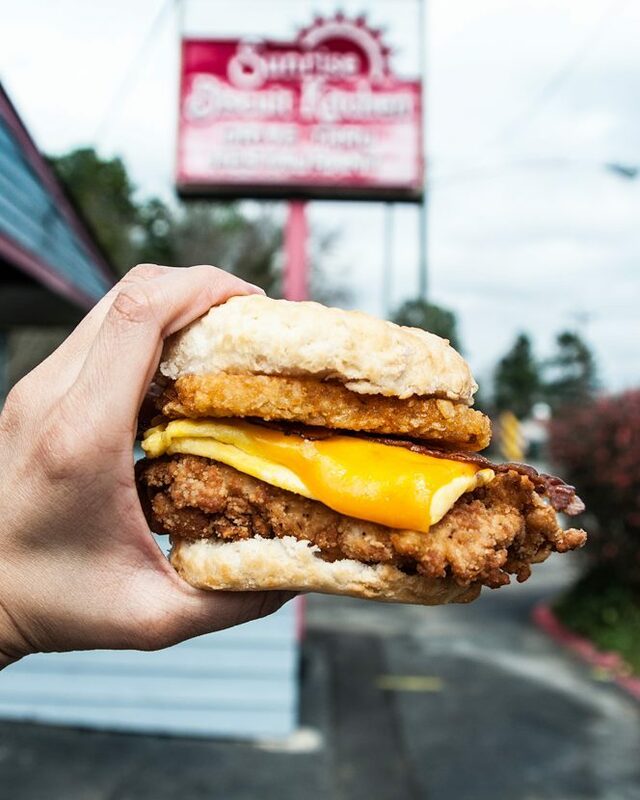 Sunrise Biscuit Kitchen, an unassuming drive-thru establishment opened only for breakfast and lunch, has become somewhat of an institution for the chicken biscuit sandwich. The first time I visited, I decided to order my chicken biscuit with added pimento cheese to give it another layer of Southern charm, and because I’m a glutton, I ordered a hash brown and slipped it into my sandwich. It’s one of my favorite life hacks. Adding hash browns to my sandwiches. Pictured above is the famed Bad Grandpa Chicken Biscuit with an added hash brown. Speaking of fried chicken biscuits, my favorite chicken biscuit sandwich in Chapel Hill is from Lula’s. They just opened on Franklin St. and have been quite impressive. Their Fried Chicken Thigh Biscuit Sandwich is my go-to order. 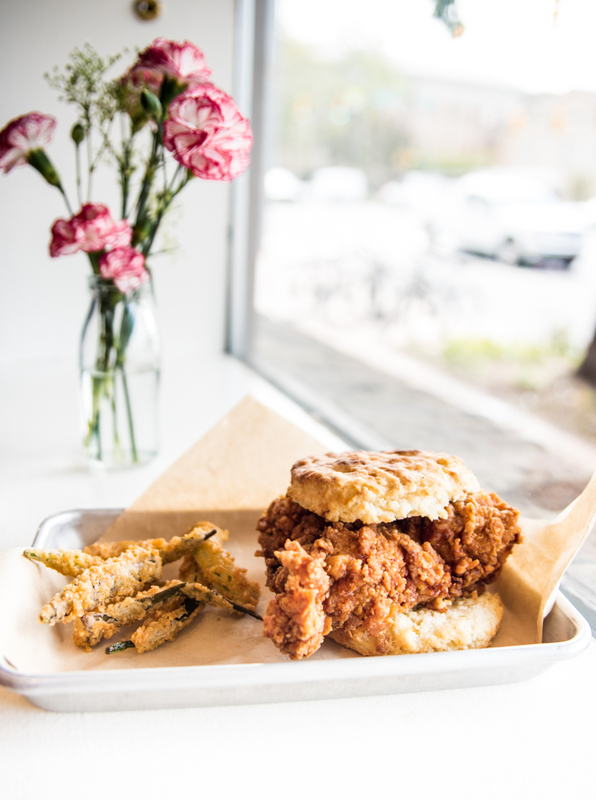 The fried chicken thigh is drizzled with the same house-made spun sage honey they give out with their biscuits. The sandwich is bigger than my head and is so reasonably priced! Look out for their fried shrimp sandwich that they have occasionally on special! bartaco has such a gorgeous patio. Their vibe is casual and young, and their tacos are excellent. I get at least one duck taco every time and also their pork tamale. Other favorite tacos are the fried shrimp tacos and the pork belly tacos. Their tacos are on the small side; I normally order about 3-4 with appetizers. (And yes I’m a big eater.) 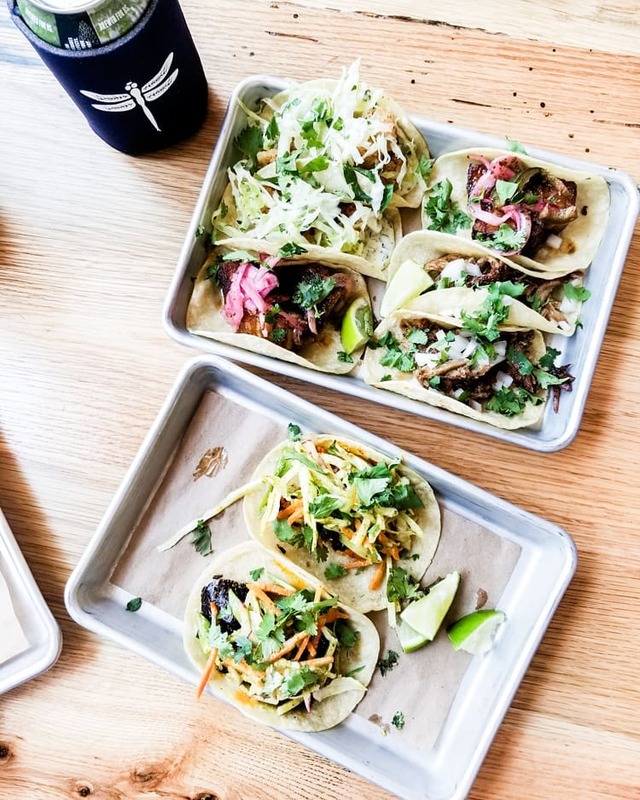 Pro tip: they have a secret lamb taco that is worth a try, and they’re releasing another secret menu item next week (hint: miso cod fish taco). I think it’s hilarious that when I ask around if people have had Time-Out, I get a lot of, “I can’t remember if it’s good because I only went when I was drunk in college.” Ha! I went sober in my 30s. It’s a bit of a dive, and it kind of made me nervous about food quality. But then I sank my teeth into the chicken cheddar biscuit sandwich (I scooped their creamy mac and cheese into my sandwich), and all my nerves dissipated and turned into moans of ecstasy. I like when a restaurant or business does one thing so well, they can operate their business with just that one thing if they wanted to! Such is the case with Merritt’s Grill and their BLT. 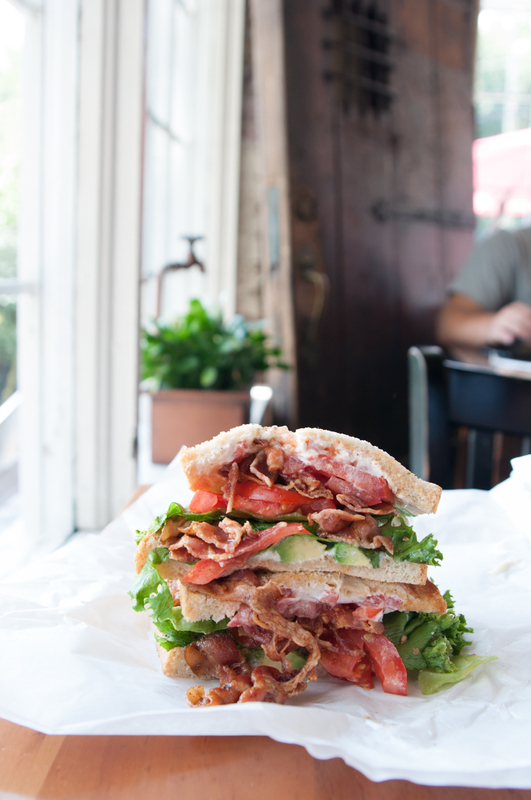 They have other things on their menu, but really, just get the BLT. I add avocado to mine and have to refrain from humming happily as I eat this famed BLT sandwich. The kids call it Med Deli. It’s a popular and casual hotspot on Franklin St. The atmosphere reminds me of a bustling cafeteria. The Mediterranean fare is delicious and there’s a market attached with fresh produce and imported Mediterranean delights. Oh, their bakery is also legit. Bring a big box of baklava home. Trust me. Two of my favorite sandwiches in town are made by the Pig. 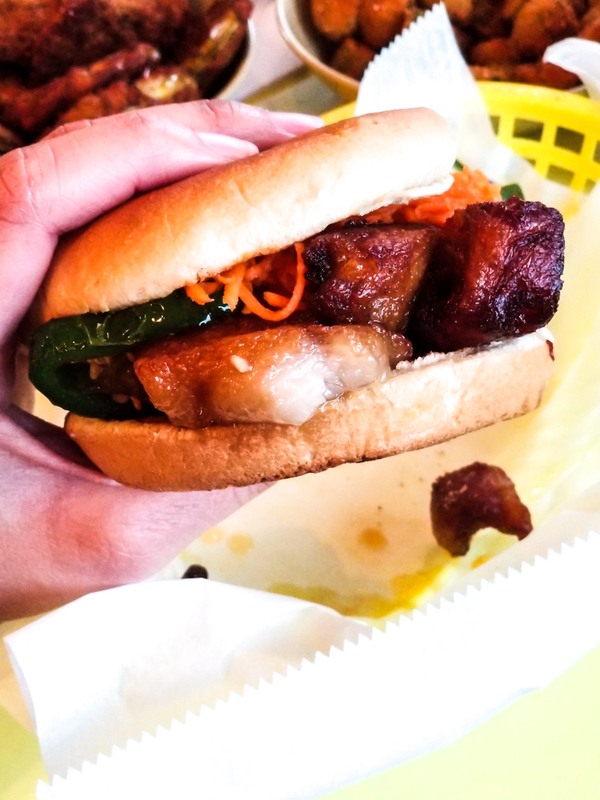 The pig cheek banh mi (pictured above) is SO good. Sugarface and I always get one to share. The other favorite sandwich is the Carolina Sandwich which is a pulled pork sandwich with pimento cheese. It’s so messy and probably not recommended for a first date, but it’s worth the trouble and calories. They also have a solid menu of classically Southern sides, like mac and cheese and fried okra. And though I’m not a big salad eater, their beet and goat cheese salad is particularly enticing. Overall, the Pig is probably not good for your health but is great for your soul. And that concludes my ultimate Chapel Hill restaurant list! Thank you so much for following along! 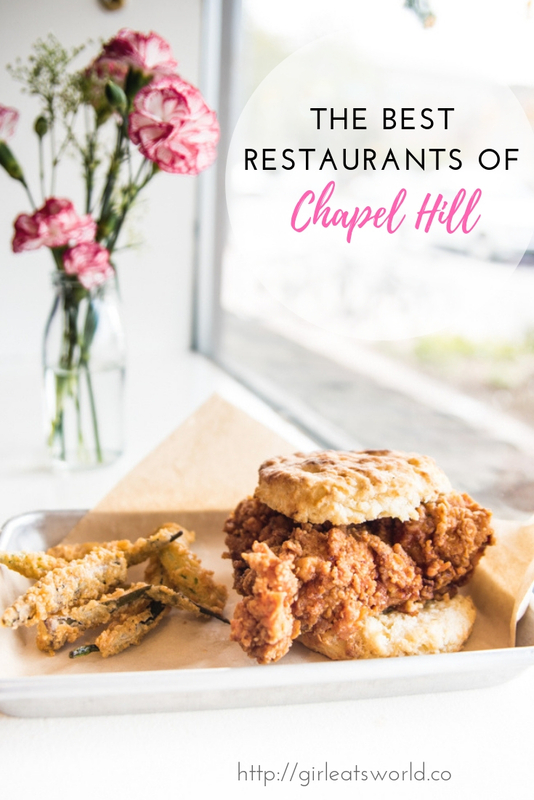 I have been grateful to a few readers who have guided me to a few delicious gems in Chapel Hill and hope I returned the favor with this post! Now it’s your turn! Did I miss any of your favorites in Chapel Hill? Please let me know in the comments!